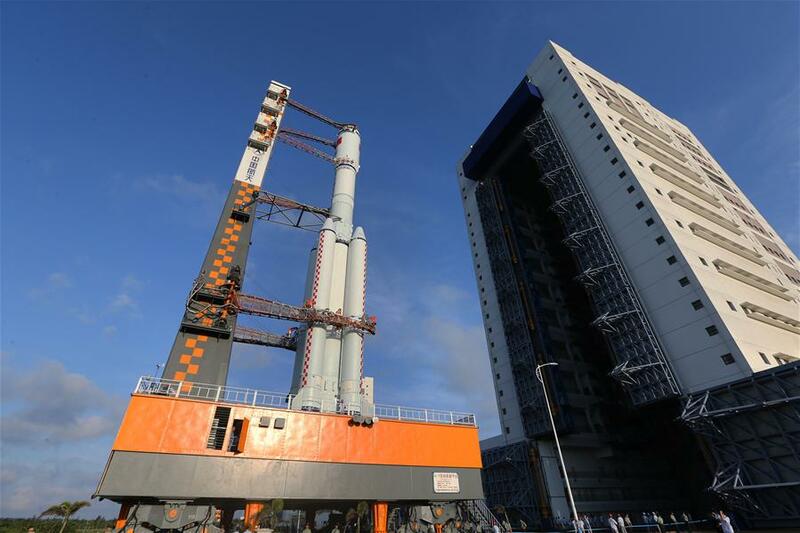 Tianzhou-1 – the first ‘Heavenly Vessel’ – set sail at 11:41 UTC atop the second Long March 7 rocket to take flight from the country’s new Wenchang Satellite Launch Center on Hainan Island. 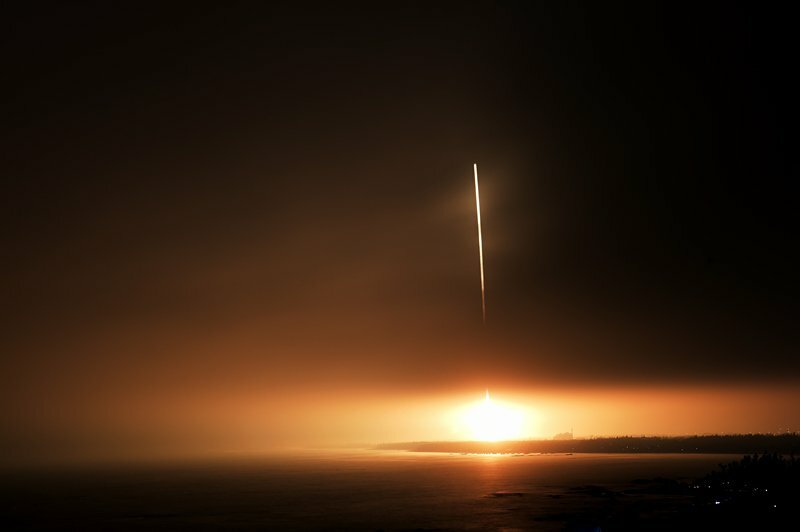 Powering away from the picturesque launch site, the 53-meter tall rocket thundered through a low-hanging cloud deck to start a high-speed pursuit of the Tiangong-2 space laboratory, acting as a target vehicle for the Tianzhou craft. Long March 7 flew into the dark of night powered by its four liquid-fueled boosters and large core stage, firing six YF-100 engines simultaneously to head toward orbit with a total thrust of 722 metric ton-force. 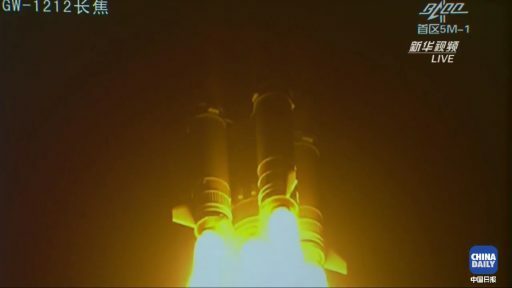 The four boosters dropped away from the rocket three minutes into the flight and the core departed a few seconds later, handing off to the four-engine second stage for a burn of six and a half minutes to lift the 12,910-Kilogram spacecraft into orbit, marking China’s heaviest haul to orbit to date. 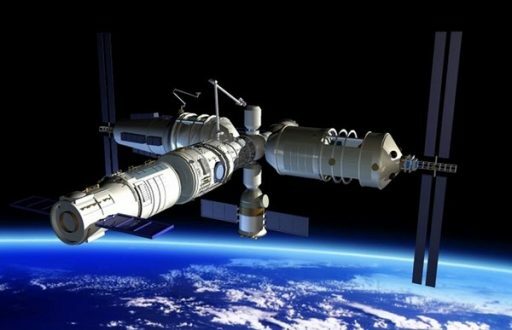 Over the last two decades, China made stepwise progress toward the country’s ultimate goal of building a large space station to serve as a permanent outpost in space for ground-breaking science and as a stepping stone toward human exploration of the solar system. Initiated in 1992 under the code name Project 921-2, China’s crewed space program was lined out as a three-phase process: Phase 1 was successfully completed with China’s first crewed space mission in 2003 when Yang Liwei spent 21 hours in orbit aboard the Shenzhou 5 spacecraft. The second phase will reach its conclusion after the Tianzhou-1 mission and included a number of fundamental demonstrations such as rendezvous and docking in orbit, sustaining humans over a medium-duration mission, proving the long-term operation of a space lab in orbit and testing a space-based cargo infrastructure. Tianzhou-1 builds the final piece in the puzzle as China assembles the technologies and operational techniques required for the assembly of a large orbiting station. With the Shenzhou craft, China has a proven spacecraft for ferrying humans to and from orbit, the Tiangong space lab modules launched in 2011 and 2016 provided important lessons for space station operations, and Tianzhou – together with the powerful Long March 7 – will give the country a way of hauling supplies, refueling propellant and external components to the new space station. 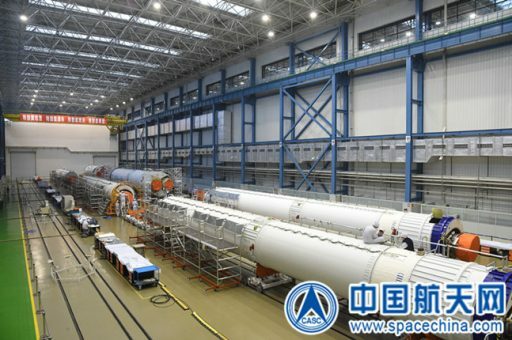 With the conclusion of Phase 2, China will have demonstrated all elements required for the assembly of the Chinese Space Station (CSS) that will consist of a large Core Module named Tianhe and two science modules, Wentian and Mengtian – all of which will launch atop Long March 5 that is among the most powerful rockets currently flying. 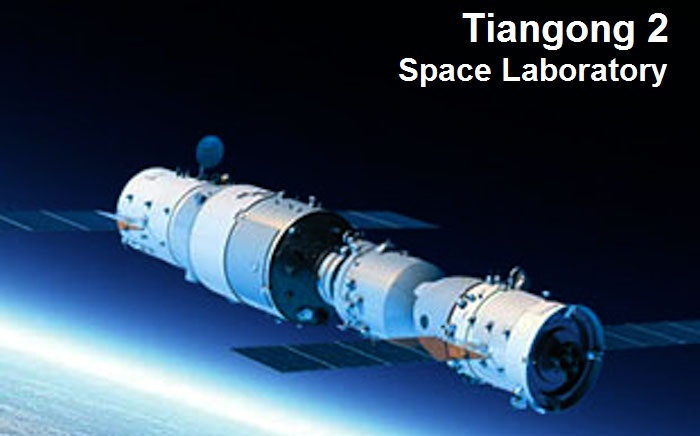 The central element of the second development phase were the Tiangong space station modules. Tiangong-1 – launched on a Long March 2F rocket in September 2011 – served as the target vehicle for China’s first orbital docking maneuvers, both under human and automated control. 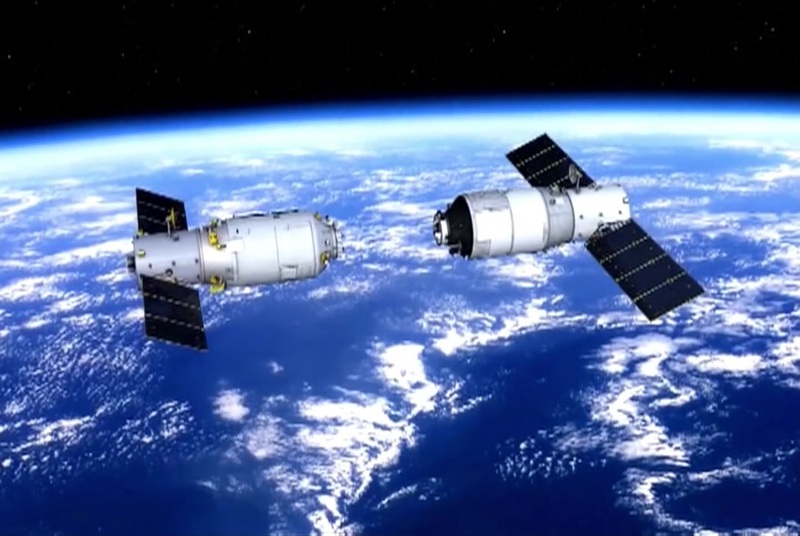 Two Shenzhou crews visited Tiangong-1 in 2012 and 2013, providing valuable lessons for extended stays in space, ranging from complex technical recommendations to fundamental findings such as insufficient foot and handholds on the prototype space lab. 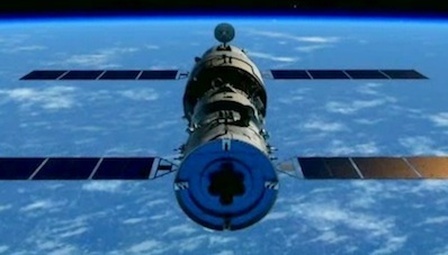 Tiangong-1 also enabled long-term operation of a pressurized spacecraft, remaining under active control for five years. Tiangong-2, implementing lessons from the first module, launched in September 2016 and marks the final stepping stone toward the CSS – hosting a two-person crew for a month-long mission, China’s longest to date, and acting as a target for the Tianzhou logistics demonstration with a primary focus on in-space propellant transfer – a criticality when aiming to keep a station in orbit for many years. The Tianzhou cargo ship is largely based on the Tiangong design, comprising a Service Module that hosts the propulsion and power systems and a large Cargo Module that can hold up to 6,500 Kilograms of supplies. 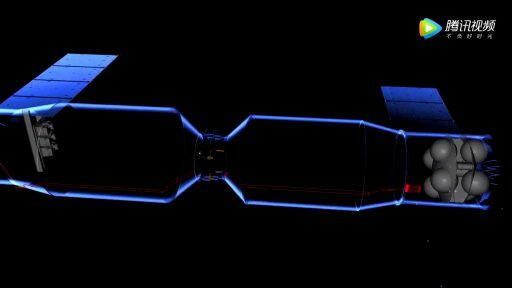 Three variants of Tianzhou are ultimately envisioned – one with a Pressurized Cargo Carrier, an unpressurized version to haul large external payloads and a combined version with a pressurized section and an unpressurized cargo carrier – similar to Japan’s HTV that serves the International Space Station. 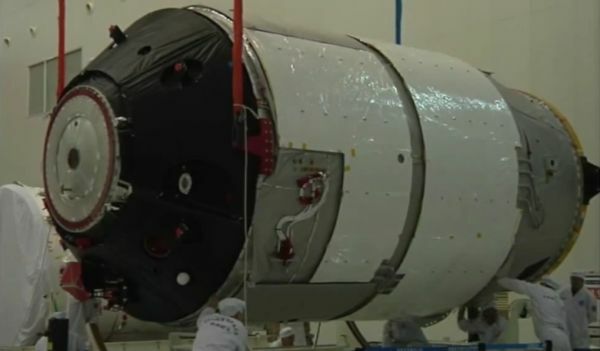 Overall, Tianzhou measures 10.4 meters in length, its cargo section is 3.35 meters in diameter and the craft has a launch mass of up to 13,500 Kilograms – beyond what China’s previous generation of rockets could lift into orbit. The interior of the vehicle’s cargo carrier offers a volume of 15 cubic meters with cargo racks installed on all four sides of the craft. The Tianzhou-1 mission is a pure shakedown flight to demonstrate the overall cargo architecture, the principles of fuel transfer and the longevity of the spacecraft, built for typical mission durations of half a year. 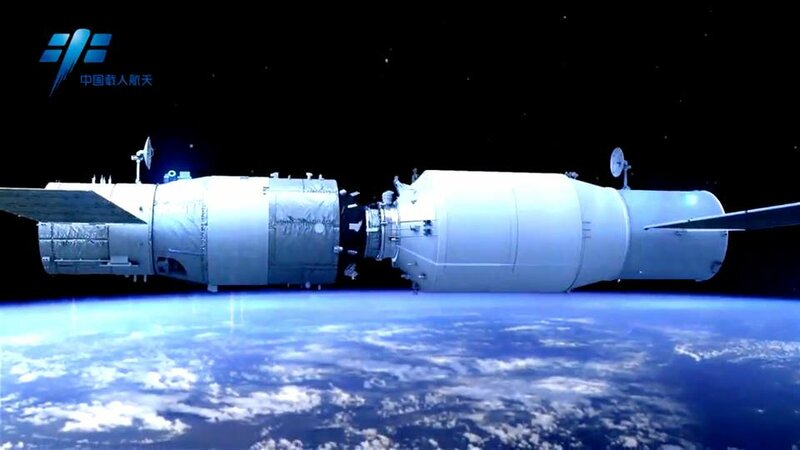 The mission has a planned duration of five months of which three months will be spent docked to Tiangong-2 with three separate docked phases planned for the mission, each facilitating a propellant transfer demonstration. No internal cargo will be transferred and hatches between Tianzhou and Tiangong will remain closed as no crew can be onboard the TG-2 spacecraft since it only sports a single docking port. Propellant transfer is the central focus of the Tianzhou-1 flight. The spacecraft hosts eight propellant tanks to feed its own engines and transfer propellant to Tiangong-2. The total capacity of the tanks is reported to be around two metric tons and the propellant transfer system makes use of four lines running the length of the spacecraft and interfacing with Tiangong-2 through four fluid connections within the docking system. Two of the lines carry fuel and oxidizer while the others supply pressurant gas. China conducted an initial proof-of-concept experiment on the inaugural flight of the Long March 7 rocket which, among other payloads, carried a fluid unit that demonstrated the physics behind China’s proposed propellant transfer system. Tianzhou-1 is also facilitating other experiments that will utilize the microgravity environment over the extended duration of the mission for research in the field of fluid physics and thermodynamics. One of the studies involves FC-72 fluid to examine interface changes, surface evaporation and Marangoni convection in the absence of Earth’s gravity that masks as number of physical processes associated with the phase change from liquid to a gas. Another study is looking at the reverse process of a gas condensing back to its liquid state using a rig with IR cameras, thermopiles and pressure sensors. Tasked with lifting the Tianzhou-1 spacecraft was the Long March 7 Y2 rocket, marking only the second launch of the CZ-7 following its debut in June 2016 to join China’s new line of rockets as the country moves on from antiquated rocket technology using highly toxic propellants to more-environmentally friendly and more powerful launchers. Long March 7 comprises a large core stage with a pair of YF-100 engines, four boosters each with their own YF-100 and a four-engine second stage – all fueled by Kerosene and -183°C Liquid Oxygen. The launcher weighs in at 594 metric tons and can lift up to 13,500 to Low Earth Orbit and seven metric tons to Geostationary Transfer Orbit – making it suitable for a wide array of applications, pegged to become the future workhorse of China’s space program after proving its reliability. 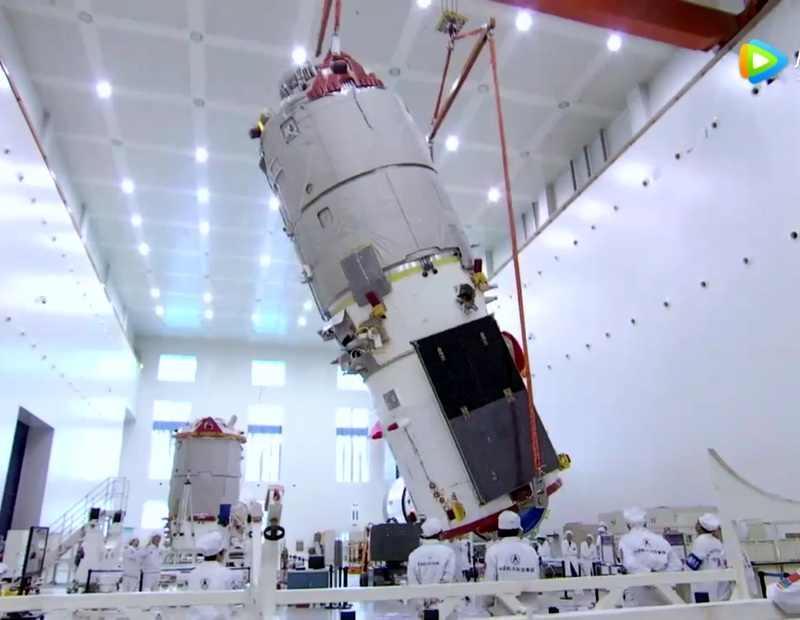 The Tianzhou-1 spacecraft left its factory and headed to Wenchang in February for final processing operations including propellant loading while Long March 7 arrived on Hainan Island in early March to undergo assembly. Rollout took place Monday morning and Tuesday was dedicated to a full countdown and launch rehearsal with final pre-flight reviews occurring on Wednesday. On Thursday, Long March 7 went through a multi-hour countdown sequence to undergo final checks before loading of propellants picked up several hours ahead of launch time to load around 540 metric tons of propellant into the rocket. Despite shower and thunderstorm activity over Hainan Island around mid-day and into the afternoon, teams were progressing with the countdown as weather was expected to calm down toward sunset. Liftoff time was precisely calculated based on the orbital geometry with the Tiangong-2 module to allow CZ-7 to dispatch the heavy cargo vehicle into the plane of its orbiting target. Long March 7 came to life as the six YF-100 engines on the boosters and core soared to a collective liftoff thrust of 7,080 Kilonewtons. Launch took place at precisely 11:41:35.361 UTC, 7:41 p.m. local time as Long March 7 began rising from the ground to blaze into twilight skies. 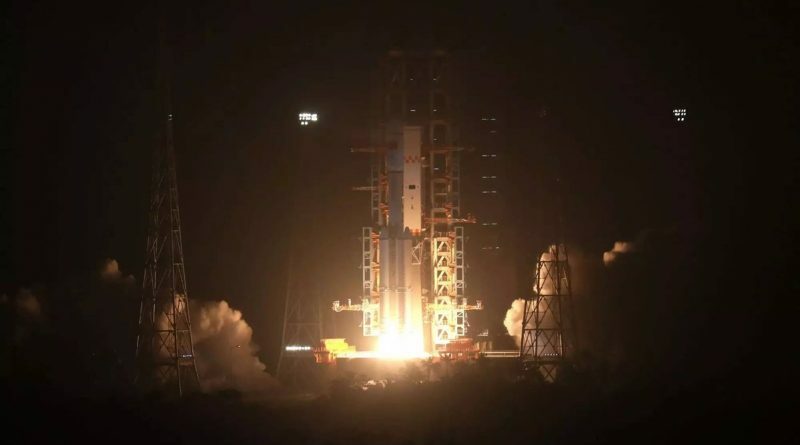 Thundering toward the dark of night, Long March 7 pitched and rolled onto a south-easterly departure path, overflying the Pacific Ocean after departing Wenchang where many spectators had gathered to experience a rocket launch in person. As opposed to China’s secluded inland space ports, Wenchang provides excellent viewing locations for large crowds including accommodations for foreign guests with a direct line of sight to the launch facility. The four boosters, each loaded with 75 metric tons of propellants, fired their engines for around 173 seconds to deliver the additional kick needed to haul the heavy payload into orbit. Within seconds of engine shutdown, the 26.5-meter boosters dropped away and the still-firing core stage gimbaled its engines for a brief stabilization maneuver before it shut down 12 seconds after booster separation, exhausting a 174-ton propellant supply. The 26-meter long core dropped away from the second stage immediately after cutoff, followed seconds later by the ignition of the second stage’s four YF-115 engines, soaring to a thrust of 73,400 Kilogram-force to give Tianzhou-1 the final push into orbit. 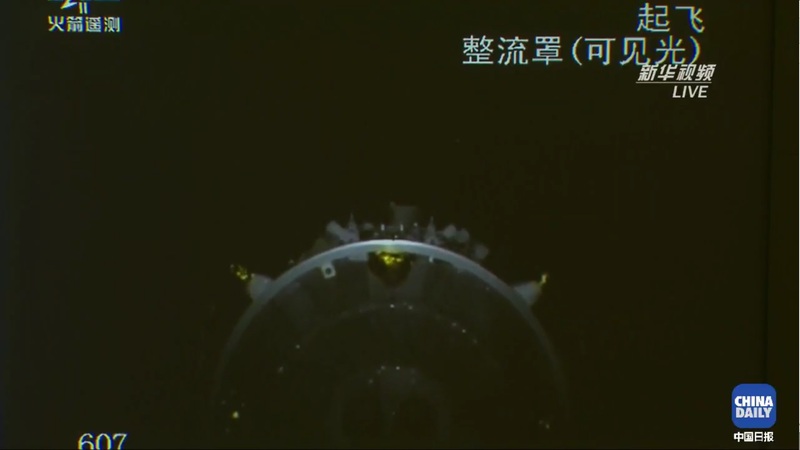 Three minutes and 37 seconds into the mission, the protective payload fairing was split open and dropped away from the Tianzhou spacecraft after Long March 7 had departed the dense layers of the atmosphere. 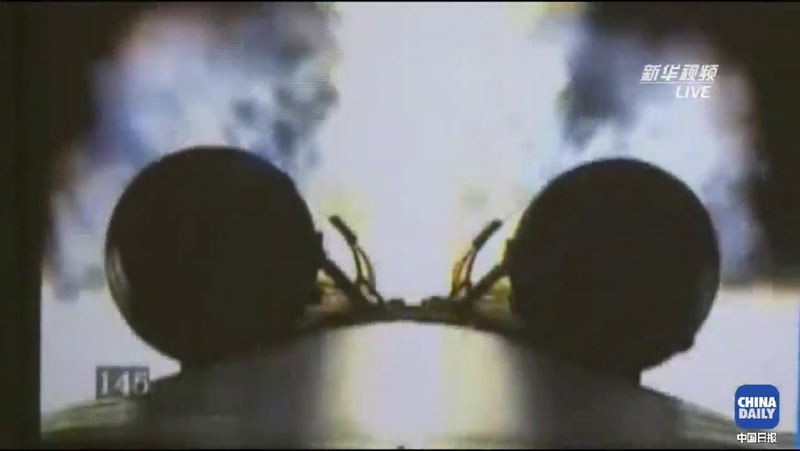 The second stage fired for around six minutes and 23 seconds, spending the last 20 seconds of its burn in partial thrust mode using only two engines. Tianzhou-1 separated from its launch vehicle ten minutes and one second into the flight, firing up its own thrusters to create a separation distance between itself and the second stage. 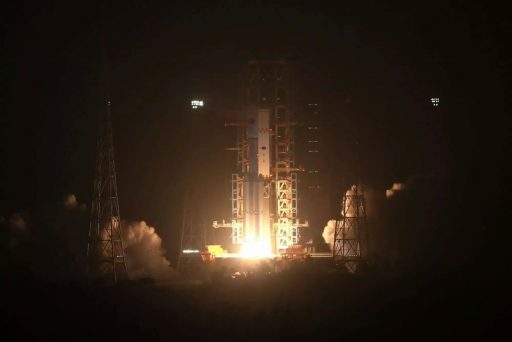 No target orbit parameters were released for the mission, tracking of Tianzhou-1 several hours after its launch showed it in an orbit of 311 by 369 Kilometers, inclined 42.79 degrees. 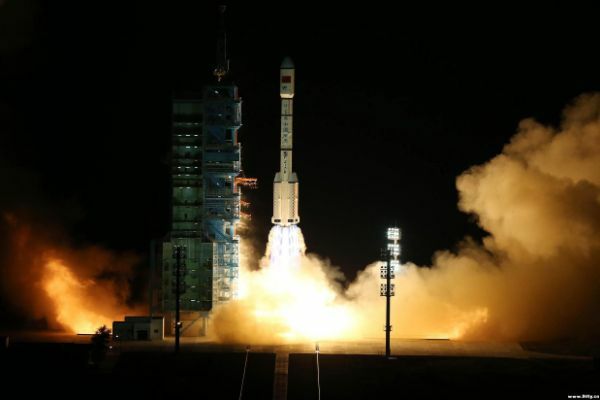 Telemetry data from the spacecraft showed the two power-generating solar arrays unfold and Tianzhou established contact with Mission Control through China’s Tianlian relay satellites in Geostationary Orbit, sailing off on its first circle around the planet. Heading off on a two-day trek to Tiangong-2, Tianzhou will be tasked with a series of orbital maneuvers to reach the space laboratory in its current 380 by 390-Kilometer orbit, inclined 42.8 degrees to either side of the equator. 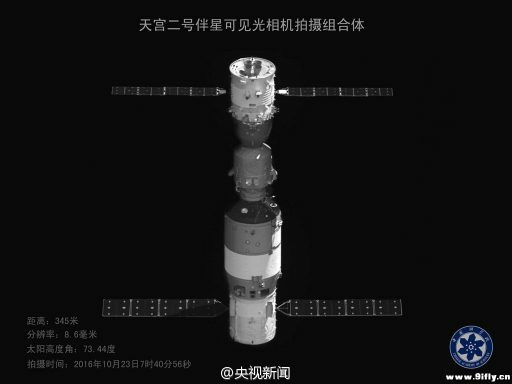 Inbound for docking, Tianzhou-1 will be the active spacecraft, marking a rare occasion where the chasing spacecraft outweighs its target vehicle as Tiangong-2 has a mass of only eight metric tons compared to TZ-1’s mass of around 13 tons. 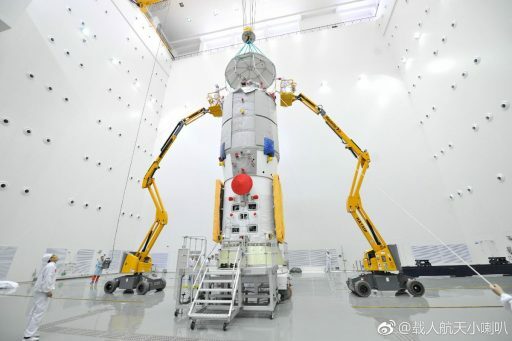 Firing up its radio and laser-guided navigation system, Tianzhou-1 is expected to complete a fully automated rendezvous with Tiangong-2 on Saturday to form China’s heaviest orbiting spacecraft flown to date.